Nothing ignited my late mom's Baltimore living-in-the-hood anger more than someone "messing" with one of her "nine months" (her kids). I have a similar protective reaction to attacks on the Tea Party/We the People. Not only have We the People had to endure mainstream media, Democrat and GOP establishment attacks, some on our side are attacking us for not being "smart enough" to reject Donald Trump. I say, have a little compassion for us. We are witnessing our beloved once great nation becoming a banana republic (dishonest and lawless government) right before our eyes. As patriots, we have faithfully done all the right things. And yet, the wrong things keep happening. On Fox News Brit Hume called us (the Tea Party) the far right. Senator John McCain called patriots who attended an anti-illegal immigration rally "crazies." http://bit.ly/1PjQhgf House Majority leader John Boehner called us the far right. Will somebody please tell me what is "crazy" and "far right" about expecting government to function according to our laws and the Constitution? Where is the compassion for We the people? Yes, my heart goes out for the people. Political Action Committees and GOP candidates raised funds, promising to git-r-done only to leave patriots suffering a string of broken promises. Adding insult to injury, betrayers in the GOP which we gave the House and the Senate call us names; even launching a war on conservatives and the Tea Party. http://bit.ly/1Em9reZ For crying out loud, how much more are We the People expected to take? In essence, both parties said, screw you to We the People. 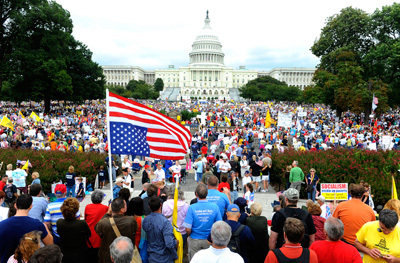 Our Washington cartel is going to further its agenda and there "ain't" nothing you Tea Party yahoos can do about it. The GOP took us (We the People) out to sea and threw us overboard. Trump threw us a lifeline. Do not attack us for accepting it. Imagine a fire is raging out-of-control consuming my home. A gang of Hells Angels bikers approaches from over the horizon. They jump off their bikes and begin helping me extinguish the fire. Do I throw up my hands yelling, "Stop! I don't approve of your lifestyle"? Or, do I simply say thank you? The Fox News strategy to "get Trump" during the GOP debate was extremely unfortunate. I agree with Mark Levin who said Fox blew a major opportunity. http://bit.ly/1WfFFUu Twenty-four million Americans tuned in to the debate greeted with soap opera questions rather than exposing the horrors Obama has released upon our country and how the GOP contenders plan to fix it. For example: Seventy percent of the population is unaware of the butchery and black marketing of baby body parts happening behind the walls of Planned Parenthood which is still praised by the Democrats. http://bit.ly/1P9akhm Why on earth was the debate moderators focused on a feud between Trump and Rosie O'Donnell? Truly unfortunate. Ted Cruz understands Trump's popularity and thinks it is unwise for the GOP to "smack Donald Trump with a stick." http://bit.ly/1L4Tphu Rather than joining the chorus of those calling patriots idiots for liking Trump, Cruz understands and sympathizes with We the People. Cruz's message is make me your president and I vow to champion your cause. Cruz was short-changed during the GOP debate receiving very little time on camera. Still, Cruz's closing comments caused him to soar in the polls; direct, strong and sincere. http://bit.ly/1MidI9T I am confident Cruz's numbers will continue to grow. I will not judge or be upset with my brother and sister patriots who are high on Trump. Any of our 17 contenders are far superior to a Democrat who will surely continue Obama's evil transformation of America. My gut tells me Ted Cruz will break the tape finishing first.